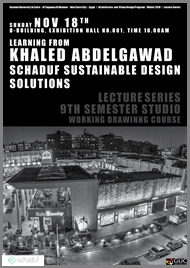 On behalf of ‘DS6 – Making Zaafarana Regenerative’ we are glad to announce a guest lecture to be given by Khaled M. Abdel-Gawad - Design Director of Schaduf – experienced in the area of urban planning, detailed planning and landscape architecture. The Lecture is to take place next Sunday (NOV. 18th) in the Exhibition Hall at 10:00 am. We expect this lecture to be of high importance especially to 9th semester students and all who are doing working drawings courses.